Cowboys, farmers, ladies’ bloomers, and hampers filled with sweet potato pie! It was the final night of Oklahoma! at Carnegie Hall, Dunfermline, and the end of an overall fantastic production put on by the Kelty Musical Association. The classic Rogers and Hammerstein tale really came to life on stage, with a very atmospheric set and an enthusiastic cast, including David J Mutch as cowboy Curly McLaine, Fiona Mackenzie as sweetheart Laurey Williams, Diane C Peet as trusty old Aunt Eller, and butch bad boy Jud Fry played by Stephen Manson. The story of Oklahoma! is set at the beginning of the 20th century, and tells of farmers and cowboys attempting to live in perfect harmony, woven together with some classic songs (‘Oh, What a beautiful morning’, ‘The surrey with the fringe on top’, ‘People will say we’re in love’, and of course, ‘Oklahoma’) and energetic dance scenes. Graeme Melvin and Fiona Mitchell also stood out as playful couple Will Parker and Ado Annie Carnes, with some fine acting and singing talents, they were a joy to watch, along with hilarious and conniving pedlar Ali Hakim, played by Kevin Reed, in a very unique suit combo! With all the ups and downs in this cute and classic production, it was hard to tell if Curly McLain would ever win the heart of farm girl sweetheart Laurey Williams, especially with her inability to make up her mind, and misunderstood baddie Jud Fry getting in the way. And with his shady past, it was clear something dastardly might occur, but the two love birds finally reached a happy ending when Fry started a fight with Curly, only to fall on his own knife – a nice relevant lesson for the youth of today! And some top class singing from Fiona Mackenzie and David J Mutch really stole the show, along with Diane C Peet’s performance as Aunt Eller; the pillar of the small-town community. KMA had chosen Oklahoma! for their 80th anniversary production, and their efforts really stuck out in this wonderful show, which also included a delightful choreography and some marvellous and colourful costumes (not forgetting the burlesque costume dance scene, in true Kelty tradition!) – in all, a credit to director Clark Stewart, choreographer Claire Robertson and musical director Margaret Moffat. Not only was it the 80th anniversary show, but there was also a special presentation on the final night, in which a NODA Long Term Service Award was presented to KMA veteran Ella Stuart – the 60-year diamond bar. Very impressive indeed! 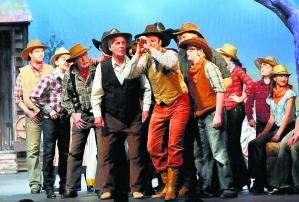 The presentation was finished off by a final rendition of ‘Oklahoma’ by the full cast, including Mrs Stuart herself. The show left everyone feeling entertained and energised, so well done, Kelty Musical Association! Wonderful review, thank you . I do the costumes and personally purchased the burlesque ones alongside most of the men’s chorus outfits. The rest were hired, as usual from the amazing Utopia Costumes in Forfar. Hope to see you back at The Pajama Game!